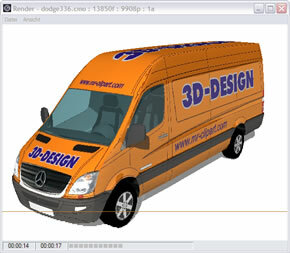 Open or import the 2D-Demo-Template with your existing graphic or signsoftware. 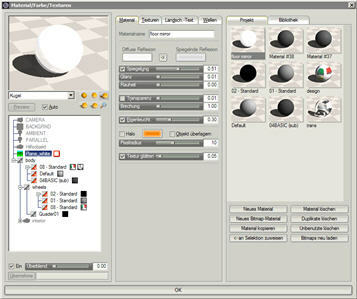 Use the AI or the CDR file from the MR 3D-Designer projekt folder. The template will be open like picture 1.1. Use this template in your existing software for your drawings. 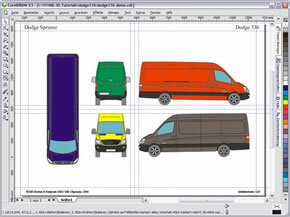 Design the car however you like, but dont change the position of the views or the text. 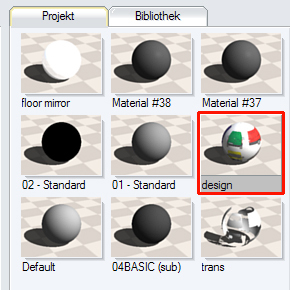 After you have finished your design you can use this file as your production file. You can use one of the foloing fileformats: BMP, JPG, PNG, PCX, TGA or TIF. 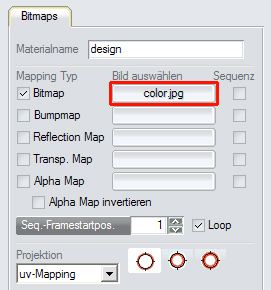 Please take care that you use the RGB colormode for the export. 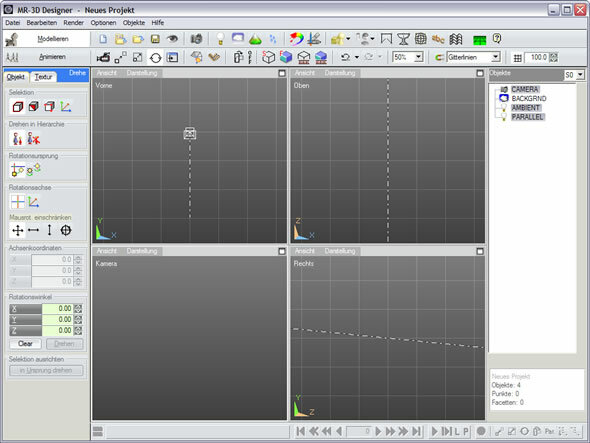 The dialog window load objekts will be opened. Select the file mb0817.cmo from the folder mb0817. 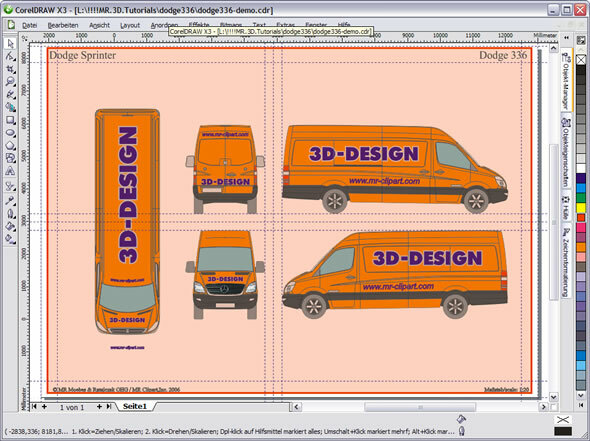 Select your design export mb0817-demo-design. 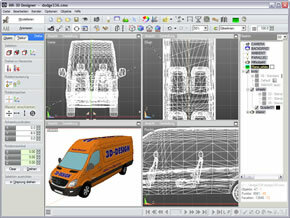 Now you can see a preview of your desing in the left viewport. Hit the button Render Final or use the shortcut "S". In the popup window your presentation is renering. Save this image as BMP-, JPG-, PNG-, PCX-, TIF- or TGA-Format. Now you can print it or send it via email to your customer. For an quick preview of the animation hit the button Render Scene Animation or use the shortcut "Shift + "S". 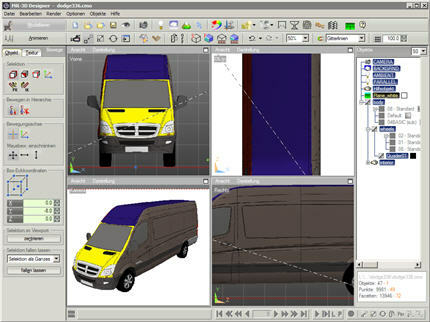 If you like the position and the placement of your desing start with the final renering. Hit the button Render Final Animation or use the shortcut "Shift + "F". 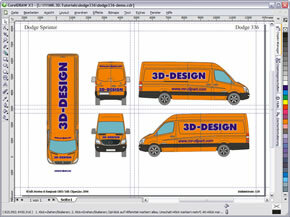 If the animation rendering is finished save this file as an AVI File Now you can send it to your customer via email.